When Rotary International President John F. Germ released his theme ‘Rotary Serving Humanity’ Rotary Down Under Supplies got to work imagining how we would reflect this concept in this year’s theme merchandise. 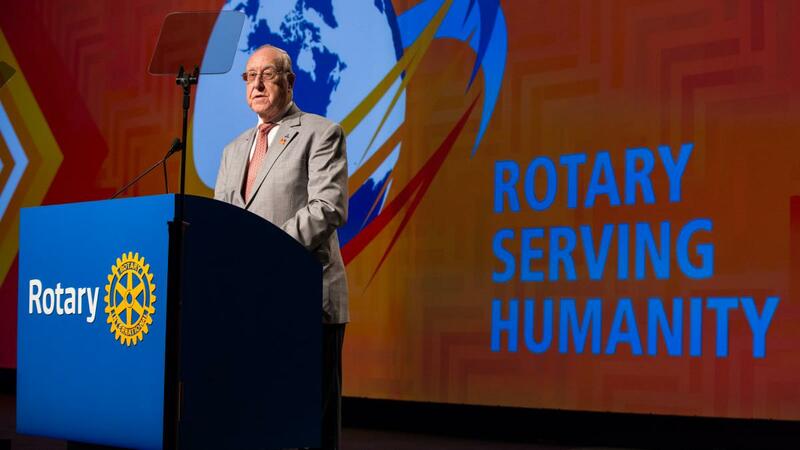 In his 2016-17 theme address Germ said, “The opportunity to join Rotary was the opportunity of a lifetime. A great opportunity to change the world for the better, forever, through Rotary’s service to humanity.” He placed considerable emphasis on Rotary’s global reach and efforts to halt diseases like polio internationally. When we received the official theme logo with the planet earth placed centrally we began thinking of incorporating a map or globe in some way to reflect the international community numbering 1.2 million that is Rotary as well as the fact Rotarians serve, as a group, humanity across the globe. Yet we also wanted to give the theme our own unique ‘down under’ spin – an Australian perspective - and so referenced contemporary Indigenous Australian artists such as Emily Kam Ngwarray to realise our map concept. Kam Ngwarray, Emily (1916- 1996). Untitled. Synthetic Polymer Paint on Canvas. Gallery of NSW. RDU Supplies heard from Rotarians what they were really looking for was quality – the sort of scarf or tie that could be worn not just during John Germ’s term with pride but into the future to commemorate the work achieved in 2016-17. They didn’t want ‘throw away’ fashion but something that would last the test of time, and could be worn to non-Rotary events such as business and formal occasions without looking out of place. We searched widely for the appropriate supplier, deciding on the Japanese based Octon Group, known worldwide for their high-quality production since becoming an official Rotary International licensee in 1982. They used high-quality silk, impressively detailed weaving techniques and digital printing to bring our designs to life. Thank you to Tim and Jane Moore for kindly modelling our designs. Just remember when you see them soon on the Milan catwalks they got their start here at RDU!